Yes - Chingford. I was brought up there until I was about 18, at which time my parents decided they were moving to Norfolk but not taking me. I had no steady job at the time, although I had joined the Merchant Navy a couple of years previously. I spent another 3 years in the Navy and then came back to London. Born in Chelmsford Hospital. Not quite a cockney! Where have you been / what have you done? After the Navy, I did some driving jobs for a year and then was lucky enough to get a job delivering TVs at Radio Rentals. From there I trained to become a TV Engineer and progressed through various departments to work in Technical Development. 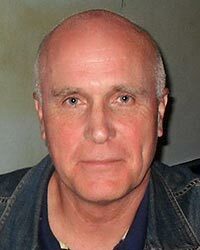 After 20 years in this field, I was made redundant and my next job was in Technical Support for computers and software. I was made redundant a further two times, then retrained as an Energy Surveyor. I did that for a couple of years and now I'm semi-retired. Cider, but only a decent one. I also like red wine. Sitting in a pushchair outside my house. I must have been quite young, because I can remember seeing my mum who died when I was 3 years old. I think it was 'Runaway' by Del Shannon. There was just something about him I liked. No, I lost it ages ago. Photography - I'm on the committee of a local camera club and do reasonably well in photographic competitions. I like Clay Pigeon Shooting but I don’t get to go much these days. I've done Karate since 1985 - I'm a black belt 4th Dan. I still find it fascinating. I mainly teach these days due to injuries sustained to my knees over the years - a very common ailment for long-term karate people. 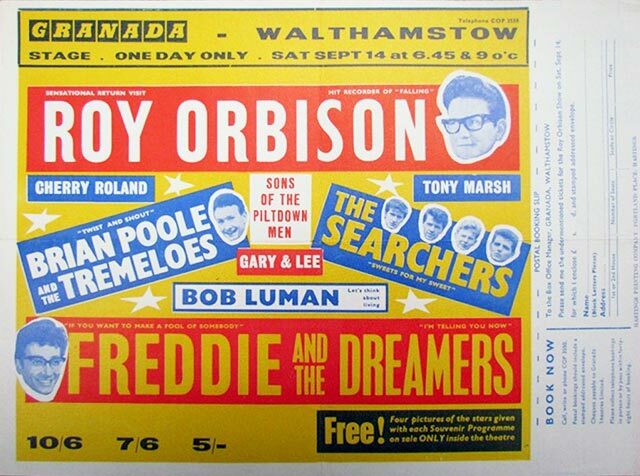 I can also remember seeing The Searchers that night - I was a big Searchers fan and probably went mainly to see them as I wasn't really into Roy Orbison, but saying that; what a fantastic voice he had! This is a flyer for the very night I'm talking about: September 14th 1963. ...and here's a Flickr link to a set of scanned images of the tour programme. They were brilliant shows in those days - so many top acts on one bill!! I think I went there two or three times in total. Another time I saw Del Shannon and I think I saw Brenda Lee - possibly on the same show. I worked for 2 hours in a slaughterhouse once. The Youth Employment Agency asked me if I would like to work with animals. What they forgot to mention was that they were dead animals. There were a lot of gruesome sights there which I didn't mind so much, it was the handling of stuff that I didn’t like. I used to be in a specialist team when I worked at Radio Rentals. We did the TV monitors at special occasions. I did two Royal events at St Paul's Cathedral - Charles & Di's wedding and the Queen Mother's 80th birthday celebration. Sort of. I played the 'riffy' bits in a heavy blues rock band and then played in a Country band for a while, but neither band went anywhere. Hardly surprising really. What really did it for me was when I accidentally walked into a Rory Gallagher (Taste) gig at The Manor House. A couple of friends and I were walking along outside and heard music so we went in for a look. I was mesmerised by his playing! After that, I regularly went there and to other local venues such as The Cooks Ferry in Edmonton and The Red Lion at Leytonstone. I saw lots of brilliant bands. I like classical guitar - I think that's probably the hardest type of guitar music to play. I also like some Folk music. Some pop is OK. Anything that sounds nice really, no matter what style. Johnny Winter - he's probably my favourite. Gary Moore - I saw him a few times in different bands. Stevie Ray Vaughan - I got into his music only a couple of years before he was killed. Taj Mahal, T Bone Walker, Albert Collins, Albert King. Too many others to mention. I like Ana Vidovic - probably because she's beautiful, as well as a great classical guitarist. I love Eva Cassidy - if you analyse her voice, she did some great things with it. James Taylor, Cara Dillon - I've seen her a couple of times live. She has a very pure voice. Unfortunately not - except, of course, at the Blues Jam. There are so many good musicians there and it's a privilege to have the opportunity to play with them. Fender Strat - I've got an old Japanese Squier that's very nice. I have a Gibson Les Paul Special I bought about 20 years ago - I'll learn to play it one day!! Recently I acquired a Fender Jazz Bass that I'm trying to play. I had an old Korean Jazz Bass that my wife bought me for a significant birthday, but I hardly played it - I had it fixed recently by Dan Smith: it now plays as well, if not better, than the Fender! Steve Marriott on Guitar and Vocals - in my opinion, one of our best singers in his day. Andy Fraser (ex Free) on Bass - I just loved his bass lines. A lot of great music for a very small sum of money with some very talented people. Stevie Ray Vaughan and Double Trouble playing live at The El Macambo. I've got the DVD though! Not to judge others too hastily. I can't, I'm sworn to secrecy.